An early goal from Demarai Gray was enough to give Leicester victory against Burnley at the King Power Stadium. Gray got on the end of a Riyad Mahrez cross for the opener and hit the post with another effort in the second half. But Leicester held on for their second successive win, leaving them ninth in the Premier League table. Burnley started the match in sixth place, just three points off Arsenal in fourth, after winning four of their previous five games. But Sean Dyche's side couldn't continue their recent good form and have dropped to seventh after suffering only their second away defeat of the season. Claude Puel made just one change to the starting line-up as Demarai Gray came in for Shinji Okazaki - and it paid off. Gray's early first-half goal proved to be the match winner and his influence was second to none before he came off to a standing ovation with five minutes left to play. The competition for a place in the starting line-up is clearly paying dividends as Gray showed desire and commitment to score, crashing into the far post and hurting himself in the process. Eager to show Puel he was right to select him ahead of Okazaki, Gray said he had to "take one for the team". "The manager always likes to rotate the team and when I play I just have to do my best and I was happy to contribute," Gray told BBC Match of the Day. "I struck the post too and as a team we had many chances to see the game off in the second half but it wasn't to be, so we had to defend well." Puel, who was "encouraged" by Gray's performance in an attacking role behind Jamie Vardy, would not give away any clues as to whether he had done enough to keep his place in the starting XI. Puel added: "It is encouraging to see different players in different positions. He made good runs and created a lot of chances." Leicester's victory means they have lost just one of their last 10 games in all competitions - and that was against Manchester City. The biggest concern for Burnley will be the extent of Brady's injury, after he was stretchered off in the first half. He had gas, air and heavy strapping on his left leg as he was carried off following a nasty tackle on Maguire. Brady has been one of Sean Dyche's most reliable players this season and after grabbing an assist and a goal against Bournemouth on Wednesday, it was a blow to see him come off within the opening half hour. Prior to that lengthy halt in play, Burnley had been well on top, having had seven shots on goal in the opening 25 minutes. 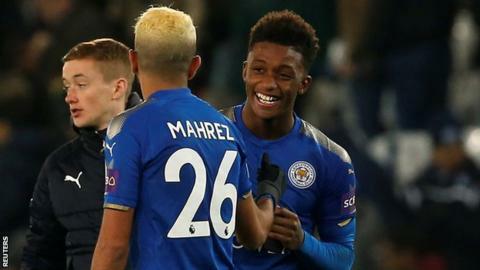 They were shaken by his departure and Leicester were able to exert pressure of their own throughout the second half and went on to pick up their second victory in a week. With 14 appearances for Burnley this season, Dyche admitted it was a "blow" to lose Brady and confirmed he had gone to hospital amid concerns of a "serious injury". Gray has found the net twice in 14 Premier League appearances this season, double the total the youngster had in 30 appearances last season. Leicester manager Claude Puel: "On the pitch it was a difficult game, they are with confidence. We saw this in the first half. Burnley manager Sean Dyche: "They're in good form. It was a poor goal from our point of view. In the second half it becomes a bit more like a basketball match and they defend and counter. "At the end we have a chance to nick one but [we did] not [get] the rub of the green. We like the fact we are keeping games tight, that's an important theme for me. I've said to the players: 'We're progressing.'" On Brady: "We're waiting on news but we think it's more serious than not serious. We'll just have to wait and see." The Foxes are unbeaten in their last seven league home games against Burnley (W4 D3 L0), including wins in the last two games. Puel has won three of his first four Premier League home games in charge of Leicester, with the Foxes winning successive home league games for the first time this season. Leicester have lost just one of their last 10 games in all competitions (W5 D4 L1) - the loss was a 0-2 defeat against Manchester City. This is just the second time in their last 11 Premier League away games that Burnley have failed to score, also drawing a blank at Man City in October. After three successive PL wins and clean sheets, the Clarets have conceded a goal in each of their last three, losing twice and winning once. Match ends, Leicester City 1, Burnley 0. Second Half ends, Leicester City 1, Burnley 0. Attempt blocked. Ashley Barnes (Burnley) right footed shot from the centre of the box is blocked. Assisted by Phil Bardsley with a cross. Attempt saved. Ashley Barnes (Burnley) left footed shot from the left side of the box is saved in the bottom left corner. Attempt missed. Riyad Mahrez (Leicester City) right footed shot from outside the box misses to the left. Assisted by Shinji Okazaki. Attempt saved. Riyad Mahrez (Leicester City) left footed shot from the centre of the box is saved in the centre of the goal. Assisted by Ben Chilwell. Attempt blocked. Shinji Okazaki (Leicester City) left footed shot from the centre of the box is blocked. Assisted by Riyad Mahrez. Attempt missed. Ashley Barnes (Burnley) right footed shot from the centre of the box is close, but misses to the right. Assisted by Johann Berg Gudmundsson with a cross. Attempt missed. Jamie Vardy (Leicester City) right footed shot from outside the box misses to the right. Assisted by Shinji Okazaki. Attempt missed. Sam Vokes (Burnley) header from the centre of the box is close, but misses to the right. Assisted by Johann Berg Gudmundsson with a cross following a corner. Corner, Burnley. Conceded by Vicente Iborra. Corner, Leicester City. Conceded by James Tarkowski. Attempt blocked. Demarai Gray (Leicester City) right footed shot from the centre of the box is blocked. Assisted by Wes Morgan. Corner, Leicester City. Conceded by Phil Bardsley. Demarai Gray (Leicester City) hits the left post with a right footed shot from the centre of the box. Assisted by Wilfred Ndidi. Attempt blocked. Marc Albrighton (Leicester City) right footed shot from the left side of the box is blocked. Assisted by Riyad Mahrez. Offside, Burnley. Johann Berg Gudmundsson tries a through ball, but Ashley Barnes is caught offside. Substitution, Burnley. Ashley Barnes replaces Steven Defour.